BMW Luxury Touring Community > BMW Bikes > K1200LT > What is a good cheap GPS for a K1200lt? What is a good cheap GPS for a K1200lt? I want to buy a GPS for my K1200lt either low price or remanufactured or used? I would like one that has bluetooth, so I can talk to it with a helmet bluetooth. Re: What is a good cheap GPS for a K1200lt? It's hard to beat the mapping programs on smartphones. I have a mount for mine that puts it right between the handlebars. Plus, they have Bluetooth and you can listen to music like Pandora. Regular GPS units are going the way of the DoDo. davebullock, joekahng and Goose11 like this. I have a garmin. Bought it for about $100. It's 5yrs old and needs replacing. Fortunately for us, they aren't selling em like hotcakes anymore, and are still reasonably priced. A friend recently told me that we can now buy one with unlimited updates. The standard suction cup attachment fits over the BMW emblem on top of radio Tupperware. I prefer simplicity. Minimal button pushing. I like to know altitudes. I also want to get one that doesn't tell me what time I will arrive. I want to know how many driving hours. Good and cheap do not necessarily come together but I would recommend the new Garmin zūmo® 396 LMT-S (4.3 screen) from Garmin as it is on sale on their website for $299 - $100 off list price!!! Lifetime subscription to map upgrades - 3 times a year on average. This is an outstanding GPS - check out all this unit has going for it - click to visit site >> GARMIN 396 Comes with lots of capabilities . . .
Comes with hardware setup for bikes but you may need to surf to get the right stuff depending on where you decide to mount the unit but it does comes with a mount. Also you can move the GPS between vehicles and even cars as well with enough accessory brackets. This unit does do one thing well that many low cost cheap unit cannot do - it has an enhanced screen and can be read in bright sunlight like the BMW NAV VI unit. Years ago I was a big Garmin 376 fan - this was a marine unit and has a very bright screen and ran automotive maps. Ever since then most of the Garmin motorcycle units including the BMW NAV series could not be read in bright sunlight well that all changed with the NAV VI and this 396 and the most recent zumo units!! These are items that may make buying older used GPS less desirable. Good luck in your search / decisions . . .
Good OR cheap I think you mean! My take on it is to use my iPhone6. Maps always up to date and you get all the other features of the 'phone by Bluetooth. I have mine in a waterproof case magnetically attached to the dash. Perfectly visible, moreso than the stock Garmin mount and easily removeable for security. About 3 months ago I found a Garmin595LM for sale on Ebay and after some bartering got it for $275....could not be more pleased with the device. 2000 Honda Gold Wing/Motor Trike Conv. Some people try to turn back their odometers. Not me; I want people to know 'why' I look this way. This is incorrect information: nearly all smartphones have GPS built in - You do NOT need a connection to use a smartphone as a GPS. I use my old S5 - without a SIM card and it tracks great! I also use a Garmin and they both do the same things, albeit different software. For routing I like Furkot and Kurviger. Basecamp is really annoying. DanDiver and Scimitar like this. Where do the maps come from on a cell phone with no service? Can you download the maps like on a real GPS? Asking for a friend. You can have live update or if outside reliable 4G, you can download a map portion, depending on which mapping service you use. The inbuilt GPS will do the rest, just like a Garmin. OSmand.net is one common option. The website will answer all the common questions too. Cheap ...The cheapest thing on a BMW is the rider ..Anyway, I use I-Way 500's . The firest one I got was like 500 dollars , now you can get them cheap on E-bay ..Like this one https://www.ebay.com/itm/Lowrance-iW...UAAOSw0T9cbKLz .. 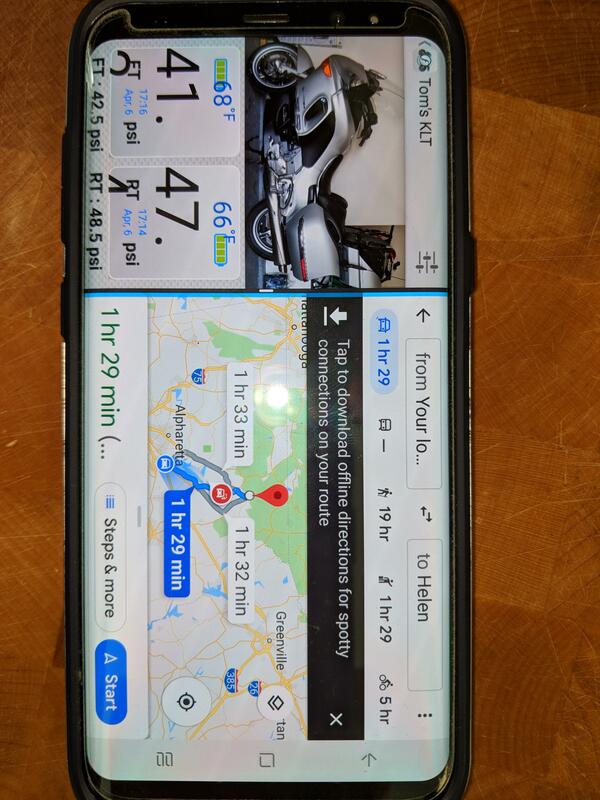 I haven't tried this yet, but my intention is to use my S8+ in split screen mode and have FOBO TPMS in one window and Google Maps in the other. Split screen on the S8+ is adjustable so I can have a smaller window for TPMS and still have, for example, a 5" diagonal window for Google Maps. It works fine on the phone, just need to see how it does out in the mountains. After I finish up all of this 12K maintenance. That said, you can ‘cache’ the maps of the area you’re going to be in with Google Maps so you have it offline, or simply use Offline map Apps and download the maps (usually OSM maps) I keep these on my phone as I’m often ‘Geocaching’ in areas without cell service, and I’m using my phone to navigate to where I need to go." Google maps lets you download maps for a given region for offline use, but as I recall it does not load a database of gas stations, etc. so you don’t have access to that as on a Garmin. I ride in many remote areas and still prefer a Garmin over my iphone for navigation work. Download "Here Gps" for either android or Apple. Download the maps when on Wi-fi before you go and it's done. You now have a stand alone GPS. No phone connection required beyond the initial downloading of the app and maps, and the once in a while updates. Something to bear in mind with older units, is the time and date rollover, due to reset in the next few days. It may knock out some older units. The GPS will still show the correct location but the time may be off. I got this working today and just wanted to share the screen FYI. Also got the Motolights figured out. During the 12K maintenance and upgrades we implemented, I had disconnected the battery. When I reconnected, I connected all blacks to NEG and all reds to POS. The Motolight harness uses a black wire for power. Had to remove one fairing side and trace the harness to figure it out. Now, the problem is these lights appear to be old and maybe incandescent, very yellow compared to the HID H7 upgrade I did. Now off to Motolights website to see if I can get bulbs that are close. 2004 K1200LT, bought Oct 2018 w/29K miles. I had disconnected the battery. When I reconnected, I connected all blacks to NEG and all reds to POS. The Motolight harness uses a black wire for power. Had to remove one fairing side and trace the harness to figure it out. I had a boat that the previous owner used a red cable for the ground and black cable for the hot. When I hooked the two large deep cycle batteries to it I just about burned the damn thing up. Thankfully the top battery terminal melted off in about 5 seconds. After that, I never trusted the wiring and put fuses everywhere, even on the ground. Lesson learned, if it isn't factory wiring you need to check it out yourself and make sure that it was wired correctly. I always add a separate fuse block for any add-ons to protect the factory wiring. Fusing a ground is an exceedingly bad idea. Scimitar and Hfjeff like this. On my FJR I added a GPS with mount fastened to the riser block. I started out using my $800 iphone and it worked great, however with the sun beating down on the screen it would get super hot and actually shut itself off. So I went on Ebay and picked up a used Garmin LMT50 in perfect new condition with lifetime map updates for $50 shipped. I then picked up a Techmount Techgripper with pin mount base. It has bluetooth and if I recall had it paired to my Sena. Worked quite well for around $110 total invested. I keep the GPS around as it comes in handy in the car now and then. Last edited by Hfjeff; Apr 7th, 2019 at 7:41 am. Guess I am lucky......if I am out of town on the bike my wife is the navigator. We have a garmin and of course cell phone. She just tells me where to go. Yeap I am screwed if I travel alone. But, those days are gone. I had a nice NAV V that came with my GS, but I replaced it with my iPhone and the Gaia GPS app. Gaia GPS allows you to download maps to your iPhone so it can work as a GPS even when there's no cell service. It even works in airplane mode so your battery lasts a long time. Gaia GPS Premium is only $39.99 per year. It gives you all kinds of maps including roads, topographical, forestry, national parks, plus many others. Complete US and Canada included. Functions include planning your route, recording your track, exporting to friends, etc. That data is also accessible from your computer if you want. I removed the NAV V and its cradle, but kept the mounting bar and put a RAM mount on it for my iPhone. My iPhone automatically goes into my pocket when I get off the bike, so not having the NAV V to worry about is nice. I will likely still use Apple Maps or Google maps when in cities to have current traffic, and be able to search restaurants and stuff. But Gaia GPS is now my go-to GPS out on the road -- or off-road. Just to be clear, I have no connection to Gaia GPS. I learned about it on a off-road motorcycle website. colored phasing tape can change the wire color. I would not fuse the ground either. Recall what happenes on an automobile trailer when a ground is lost. All kind of issues.